With major redevelopment projects in the works in Portland and other Beaver State hot spots, utility companies and municipalities are turning to the air when in comes to Oregon transmission line construction. Across the country, helicopters have been tapped for power pole replacement and installation, as well as the stringing of transmission lines. These types of jobs have long been completed using manpower and ground cranes. However, when the process takes to the air via helicopter, the arduous task is completed in a matter of hours and days instead of weeks and months. This precision, detailed operation is done by a network of trained pilots and linesmen and is fast-becoming the method of choice in Oregon. Oregon has more ghost towns than any other state., but this outdoor lover’s paradise has plenty of bustling towns that are growing. Tourist attractions abound in Oregon with destinations like Crater Lake, the deepest lake in America, and the picturesque Columbia River Gorge, making it a prime vacation spot for many. Portland has more breweries to check out than any other city on the US map along with other draws and is currently in the midst of a large scale redevelopment project. Three large redevelopment projects are in the works, which will change the look and feel of the city of Portland. With commercial and residential development projects moving forward across the state, helicopter services are an integral part of the process working with utility companies, municipalities and contractors. While Oregon transmission line construction won’t help the more than 300 ghost towns, these abandoned spots still make for great stories around the campfire and posts on Instagram. 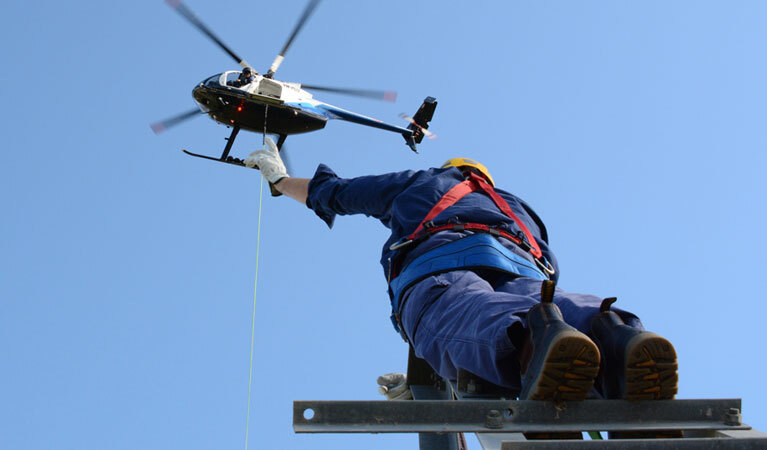 Helicopter services may be relatively new to utility companies, municipalities, and contractors throughout Oregon. However, they have been doing extensive work with utility pole installation, wire stringing, aerial trimming and more around the globe. FairLifts has access to the growing network of seasoned pilots and linesmen adept at transmission line construction by helicopter and can assist commercial and private development projects and others in engaging these unique, efficient aerial options. As Portland and other Oregon cities engage in redevelopment projects and infrastructure repairs, heavy lift helicopters are essential in transporting equipment and materials to construction sites. Unlike traditional ground transport, heavy lift helicopters can access even the most hard-to-reach spot in Oregon. Once a utility pole is installed, the time-consuming process of stringing wires begins. This process when completed by conventional ground operation can take weeks or months in larger areas. Helicopters can finish the job in hours, which is why transmission line construction is being completed more and more by air. As traffic congestion gets worse in Oregon cities like Portland, accidents rise. When utility poles are damaged in an accident, ground replacement is a long process causing further traffic delays. Helicopters, however, can complete the same job in a shorter amount of time, making them a top pick for installation and replacement throughout the state. Before any commercial or private project can get off the ground, a site inspection is a requirement. Whether it is a pre-construction inspection, an infrastructure check after a major storm or a traffic control survey, helicopters are able to complete ROW and site inspections quickly and efficiently. Any construction or redevelopment job entails the movement of crews, equipment, supplies and more. Unlike their ground counterparts, helicopters can access remote areas throughout Oregon as well as offshore destinations. Helicopters can also place equipment and supplies where they are needed, eliminating the time and expense spent moving them after delivery. Experts are standing by to get you a fast quote for your transmission line job in Oregon! Transmission line construction is more affordable than you think. Contact FairLifts by telephone or our convenient online contact form to learn more about the helicopter lift services available throughout Oregon. We offer free consultations to help find the ideal aerial service for your commercial or private project as well as free quotes for specific helicopter services.